One-of-a-kind, hand-blown glass pumpkins and gourds will be on sale during the 14th annual School for American Crafts’ Glass Pumpkin Patch fundraiser this Saturday, Oct. 13. 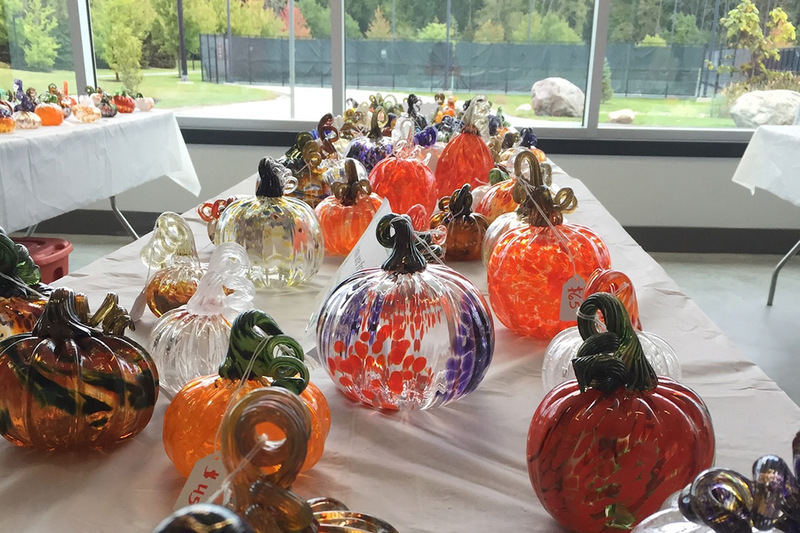 An annual fall tradition returns to Rochester Institute of Technology this weekend when this year’s fall crop of one-of-a-kind glass pumpkins and other favorites are ready to be picked on the university’s campus. The School for American Crafts’ (SAC) glass program in RIT’s College of Art and Design will sell its unique, hand-blown glass pumpkins and gourds during the 14th annual Glass Pumpkin Patch fundraiser. This year’s sale will take place from 10 a.m. to 2 p.m. on Saturday, Oct. 13, in RIT’s Gene Polisseni Center, located on the south side of campus. Students from SAC’s glass program have created the colorful hand-blown glass pieces. Attendees are asked to support the “green” effort and bring their own bags for purchases. Cash, checks and major credit card payments will be accepted. All proceeds from the sale will benefit the RIT Women’s Council Scholarships, Bridging the Gap Fund, and the Visiting Artists Series for the RIT glass program.